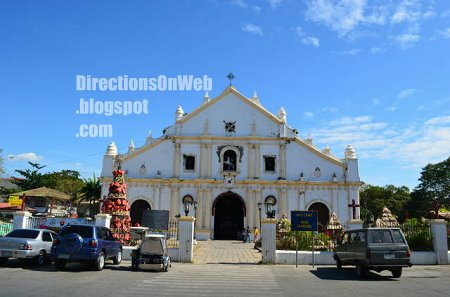 I wanted to maximize my stay here to give readers more directional guides on how to commute to important places, most especially those individuals or group of individuals who would plan to visit Ilocos Region for the first time. I was also thinking that my sudden trip here would be an excellent opportunity to feature initial batch of photos I would be taking on new DSLR camera Nikon D5100. I didn't have any knowledge on photography even though it's my dream to explore the art of creating stunning images out of ordinary objects. The Vigan-bound bus terminal is located at Lagasca St corner Gen Antonio Luna. It's right at the back of Ilocos Norte Provincial Capitol. So, if you're at the front of the Provincial Capitol or the plaza to its front in which Tabacco Monopoly Monument is situated, just go to the back of the neo-classical designed building. You get to see the road sign that reads General Antonio Luna and upon looking, Lagasca Street road sign is very visible. From Hotel Tiffany, walk towards the Sinking Bell Tower that you see from the front of the hotel, then go right at the next street which is General Antonio Luna. From the corner of Gen Antonio Luna and Gen Segundo Ave which is the street of Hotel Tiffany, walk past Paco Roman Street. Next to it is Lagasca. From Isabel Suites, walk past Jollibee and go right at the street that bordered Jollibee to the south which is Primo Lazaro. Walk past Paco Roman and turn left on the next street which is Lagasca. The bus is located to the other corner which is General Luna. You can see the location map of the terminal of bus bound for Vigan at the bottom of this post. You may click here to see the map now and click the back button above the map to get back here and continue reading this post. The bus here leaves at 7:00 am. So, if you don't want to be left behind, make sure you're early. Travel time from Laoag City to Vigan City is 2 hours and 15 minutes. Observe as I document my actual tour from Laoag to Vigan's spots and back to Laoag in the afternoon of January 5, 2012. The bus from Lagasca is only good for one round trip. It returns to Laoag City at 3 pm. But don't worry because, you can get back to Laoag anytime via Partas Bus which have Laoag bound bus every 30 minutes 24 hours a day. Towards the end of this post, you get to learn how I got to the Partas Bus Terminal. The bus arrived at its terminal in Vigan City, 9:17 am. I took a motorized tricycle to "Vigan Baluarte", my first destination, at 9:31 am. Of course, by that time I had already talked to some locals and had my route planned out. Fare to Baluarte is Php 20. I arrived at Baluarte 9:39 am. 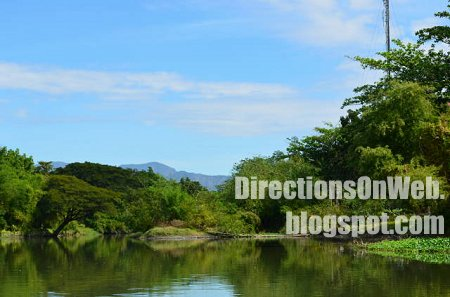 It's an 80 hectares of terrains, hills and mountain sides that serves as natural habitat for Gov Chavit Singson's personal collection of wild animals, most prominent of which are the ostriches. Other animals you get to see are: tigers, donkey, camels, stags, colorful pheasants, parrots, macaws and a lot of others, all roaming around. 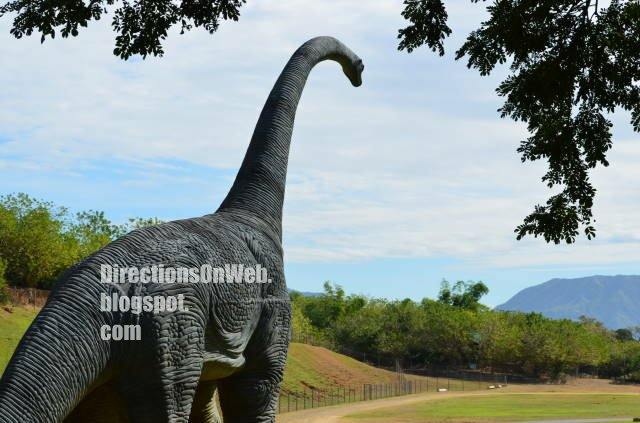 At first glance, you would think as if you're in Jurrasic Park because of a life-size Alamosaurus Dinasour statue, until you see the animals of Quaternary Period, our time. 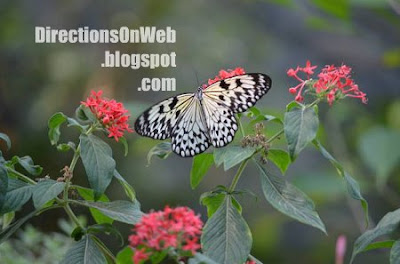 Baluarte also features Butterfly Exhibit, which piqued my weakness in photographing flowers. I took some shots of them. Hope you like my untrained hand in focusing and framing objects. As I've said I'm inexperienced. At least, for now. There's no entrance fee to Baluarte. Right outside are souvenir stores. Tip from me: If you're in a budget, consider buying goods from Vigan's Public Market. Prices of items outside Baluarte are way too high. One thing I noticed aside from being picturesque of Baluarte clearly is it's being well-maintained. The fortress is very clean and the animals are well-fed as you would notice immediately. As expected there's a terminal of motorized tricycles immediately outside the gate. So, I headed out to my second destination via one of these tricycles. I left Baluarte at 10:28 am and arrived at the site of "Vigan River Cruise" 10:39 am. Fare from Baluarte to Mestizo River, the site of the river cruise, is Php 60. Ticket in the boat ride of Vigan River Cruise costs Php 100. Boats used in the cruise are like those small wooden fishing vessels used by many ordinary Filipino fishermen called "bangka" in Tagalog. Each boat has outriggers for stability and safety of riders, which is good for rough river. But don't worry, the Mestizo River is calm all the way. At 10:43 am I was on board of this boat and begun the journey though times. 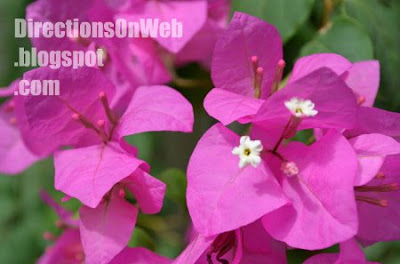 Vigan River Cruise along the historic Mestizo River is a discovery of Vigan's History that dates back to Spanish Times. It's the showcase of Vigan's culture, heritage and it's people's indigenous contributions to the society, lifestyle and progress of the Philippines. As you cruise the river, a synchronized narration is played in the background. There are countless dioramas along both sides of the river. Each diorama symbolizes an important event in Vigan's history and as you get pass each diorama, the modulated voice of female narrator tells the story behind depiction of a particular diorama. From the transfer of Northern Luzon diocese to Vigan, to the root word of Vigan itself. From Spanish discovery of the high potential of soil and climate of Ilocos for cultivating tobacco that led to imposition of tobacco culture to all farmers and the ban of growing other crops, to how the popular dish called bagnet was started. 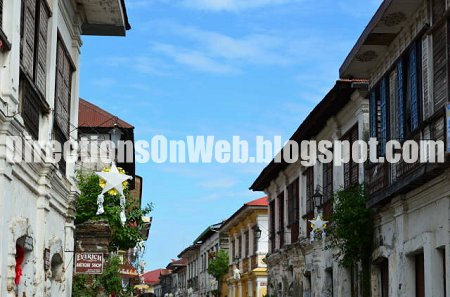 From the story behind the name of Mestizo River, to the different livelihoods that spawned out of the river, you get to discover important milestones in Vigan's history in an unhurried and unconcerned fashion. Other visuals are the fish pens in various parts of the river where school of tilapia go up on the surface from time to time as they are being fed by farmers. There's also a work in progress for the betterment of this body of water that considered to be among major sources of pride for people of Vigan. You get to photograph a fisherman in his small boat pulling up a fishnet, and even some locals with their catch on their way home. Meanwhile, mangroves and other plants endemic to river banks lined the whole stretch of both sides. After enjoying the cruise which finished at 11:23 am, it's time to get to the "Vigan Heritage Village", the only colonial town in the Philippines and for which Vigan is known. I had made an arrangement with the tricycle I'd ridden from Baluarte to wait for me. Actually, he offered the service to the Heritage Village. I just accepted it for the reason of time management. We left Mestizo River at 11:25 and arrived at the corner of Liberation Blvd and Calle Crisologo at 11:37 am. It's the gateway to Heritage Village. From there one can see the colonial past of Vigan through the Spanish houses and buildings that lined up the whole stretch of Crisologo up to Plaza Burgos. You begin the tour of the Heritage Village right at this crossroad all the way to the other end. This is the best spot to start photographing the colonial town. Now, finally I got to see the place I've been wishing to step into for years. And I enjoyed it. There are lots of souvenir shops, cafes and a hotel right along Crisologo. I had wanted to eat right there to cap my tour of the renowned destination. And so when I got a bit tired I found this small restaurant which serves Ilocano dishes in affordable prices. I had lunch at 12:15 enjoying every chew of all Ilocano dishes. 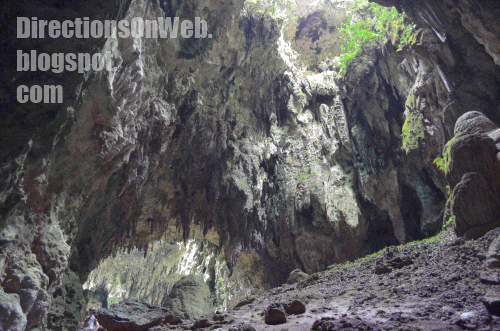 See separate post of my food tripping in Ilocos Region which will be coming soon. I also bought some souvenirs and then after the tour of Heritage Village I went to Vigan Cathedral. At around 1:30 pm, I thought it's time to go to bus terminal to be in Laoag before dusk. So, I just took a tricycle for Php 15 to reach terminal of Partas Bus. You just plug down a motorized tricycle and ask the driver to take you to Partas which is near. Wait for bus with "Laoag" sign. At 1:45 pm the bus arrived and at 2:00 pm I was on my way back to Laoag City. We arrived in the Partas Terminal in Laoag at 3:45 pm. The terminal is a bit far from the centro and the bus is not allowed to unload passengers along the way. So I just took a tricycle to get to my hotel. I paid Php 20. That's how to get to Vigan City from Laoag City. Coming up is my trip to Pagudpod. Watch for it. And btw, congrats to your new DSLR, wow! fruits na ba yan ng blogging? hehe. This blog is getting to a higher level. Before it was in anila and now the useful info has now reached the Ilocos region! oo nga e at naconquer ko din and land mo hehe. thanks, yup... kelangan na dahil thinking of going to other places out of town. yup, pero malay mo you will get ample of sponsors and they will allow you to go anywhere and make directions from there aside from Manila. for that, nationwide na ang scope mo.hindi naman siguro malayong mangyari un. Naku sana magdilang anghel ka haha. Uy pero ikaw nakita ko may direct sponsor ka na ha. Congrats pala. If any body want some adventure and chill tour i recommend to come Pakistan you can easily find cheap flights for pakistan to do adventure at very cheaper rate. Thank you for sharing your Vigan experience with us. Are there other buses in Laoag that goes to Vigan at an earlier time? We're hoping to be in Vigan as early as 8AM. @ Maan. You are welcome and thank you as well. I am not sure whether there are other buses that leave earlier or none. What I suggest is to ask trikes' drivers or you can inquire at your hotel's concierge. Hope this helps. question lang po, how much is the fare from vigan city to laoag? @ Joy Fernandez. Hello, sorry ha, I forgot the fare on that one, my apology.